One of the most famous haunted places in Alabama is the Pickens County Courthouse. The current courthouse is the second courthouse to grace this rural Alabama area. 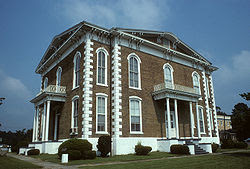 The first county courthouse was set ablaze in 1876. The fire was terrible. It destroyed the beautiful old building and left nothing but ashes in its place. Pickens County has never been a big place. It isn't graced with amazing architecture or great art so when the courthouse that was the most beautiful place in the county burnt to the ground, the people were out to get blood. This wasn't helped by the fact that Union troops had torn through Pickens county twelve years early and burnt everything in their paths, including the Pickens County Courthouse. As the citizens began work on their third courthouse, the began looking for someone to pin their rage and hate upon. Henry Wells was a freed slave with a bad reputation. He was known to get into numerous brawls and fights. Wells had been on a burglary spree and he was the number one suspect in the arson case. It was believed that he had broken into the courthouse to rob it and set it on fire. Other sources say, that Wells burnt down the courthouse to burn previous indictments against him. According to the legend, Wells was apprehended and taken to the new courthouse to wait for trial. The Sheriff knew that trouble was coming. He had heard rumors about a lynch mob, so he took Wells up to the attic of the new courthouse and hid him there for safe keeping. The mob gathered beneath the courthouse with all their wrath and fury. The screamed and yelled for Wells' blood. Wells was terrified and in an act of panic he went to the window and yelled out to the crowd below. He yelled, "I am innocent. If you hang me, I will be with you always." As he spoke, lightning struck the courthouse. The next day, Wells was hung and no sooner had the noose left his dead neck than an image of his face appeared in the attic window of the new courthouse. His face is still there. People come from all over to now to see his phantom face burnt into the glass, serving as a reminder of Henry Wells and his dying words. That's really cool! If I ever get back down that way I will be sure to go see this for myself! Thanks for the post! What a neat picture! And an even better story. Sad and unnerving, but it sure left behind some haunted history and a heck of a ghost story! Good one, Jessica! The picture is chilling! I would be a cool place to visit. I live in Alabama, and I've been past the building a couple of times. I don't believe in ghosts, but I love to read about them from time to time. It's always seemed man-made and faked somehow to me, but you never know. I wasn't there, so I can't say whether or not the story is true or false. I can tell you it makes one heck of a story worth telling to these gullible rednecks around these parts. I was raised in Alabama and saw the face in the window, it is a lot more face-like and scary when seen in person (I don't think it photographs very well.) I don't believe in ghosts either, but I saw the face in the window. Somehow I doubt that it is a 135 year old hoax that no one has ever made a dime from. Some folks believe it is a "lightning portrait"
You can pay money and they will let you knock out the window with a hammer and they have it replaced and the face is always still there. They will let you pay some money and knock the window out with a hammer then they have it replaced and the face is always still there . I actually seen the face and it blew my mind!!! !